September 1143. 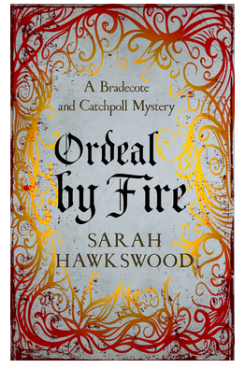 Serjeant Catchpoll hopes a fire at a Worcester silversmith’s is just an accident, but when there is a second fire, and a charred corpse is discovered, he has no choice but to call in the undersheriff, Hugh Bradecote, to help find the culprit. With further fires, a hooded figure stalking the streets, and a possible murder that has gone undiscovered for some months, Catchpoll recruits man-at-arms Walkelin as his ‘serjeanting apprentice’. The trio have to work together to avoid getting more than their fingers burnt in this puzzling investigation. Available in hardback and ebook from Allison & Busby. Paperback available from 23/3/17. Available as an unabridged audiobook from Isis Audiobooks and downloadable from Audible and iTunes. Read by award nominated narrator Matt Addis.